Event name tags seem easy enough. Right? You have a list of guests attending your event. You take your list, print the name badges, and hand them out. Boom. Done. Right? Having planned events ranging from intimate speaker sessions to global conferences, from Chicago to Australia, I’m speaking from experience – there are a few bumps in the road. For instance, what do you do when your CEO asks you to register two new guests, and you’ve already got your alphabetized name badges printed, inserted into their holders, and packed to go? Or what happens when a guest shows up on the event day, and for whatever reason you don’t have a name tag for them? Or, you have the name badge, but the attendee’s name is misspelled? Whichever situation arises in your event marketing execution, I’ve got you covered! Before we get too in-depth, here's a quick overview on how to make name badges. After the overview, we'll go into plenty of name tag execution tips and tricks. To make name tags for your next event, first choose the materials you will print the names on. You could buy stickers, or perforated paper and plastic holders designed for name badges. 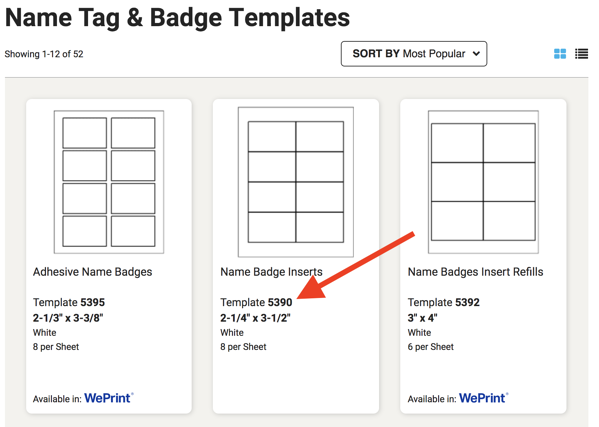 Find the template that goes with the name tag paper you bought, and do a mail merge with the template and your spreadsheet of event attendees. Remember to have everything in alphabetical order in your spreadsheet and when assembling the name tags. 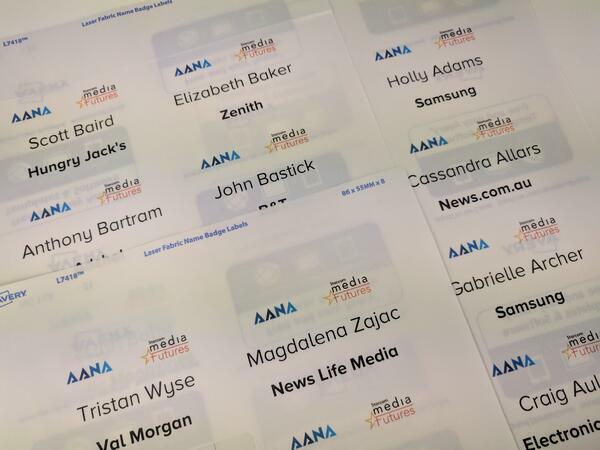 Get ready to read anything and everything you will need to think about when printing your own name tags, plus a bonus section covering those super-fancy conference name badges! So, let’s go back to basics, starting with the alphabet! Name badges are an important task on your event planning checklist. When getting ready to execute that step, be sure you take your spreadsheet of attendees and “sort by alphabet” actually creating any name badges. This will save you a lot of tedious time spent alphabetizing after they have been printed. It doesn’t matter if you sort them by first or last name, and it’s a simple step, but an important one to remember! By keeping name tags in alphabetical order each step of the way (printing, assembling into holders, transporting them to your event venue, and unpacking them at the registration table), you will make the registration process efficient for both you and your guests. What Information Goes on Each Name Tag? Ok, yes, the first one is obvious – you will put the guest’s name on the name badge. 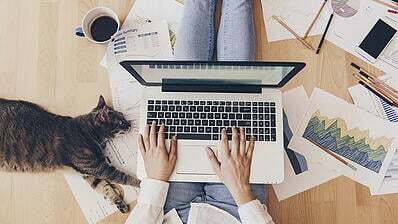 But there is additional information to think about, such as the company and title. Name tags are essential in corporate event planning when attendees are focused on networking. 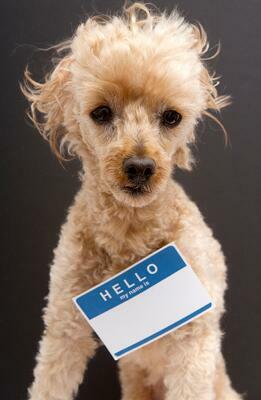 However, be aware of putting too much information on each name badge. There’s only so much room on that little cardboard square! I recommend printing each guest’s name and company. While it’s fine to include job titles, some of them can be quite lengthy. You’ll avoid the risk of an inaccurate title; an employee could register multiple people and get it wrong. You’ll also keep your name badges clean and easy to read. Once you know the information you want on each name tag (and your names are in alphabetical order! ), how do you get those names formatted onto the paper? Keep in mind the name badge holder when you make your decision – make sure the paper you print on will fit the plastic holders! If using a plastic holder, the “name badge inserts” are a thicker paper, like cardstock, which is perforated for you to split apart. Whichever you decide, once you have purchased your paper, you need to find the correct template online. Every major brand will have a corresponding template for you to download. 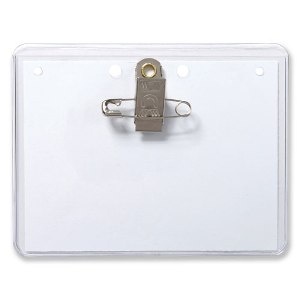 For example, Avery, a common brand for name badge supplies, has this page with 52 name tag and badge templates. When so many of the templates have six to eight name badges on a page, you can’t use sight alone to ensure you’re using the correct template. I have zero doubts you are a very intelligent event planner, but I’m going to bold and repeat that since it’s so critical: Make sure you use the template with the same number! Look at the “adhesive name badges” on the left, and the “name badge inserts” in the middle. They both have eight rectangles. They don’t look that different in size. Right? It should be close enough if you pick the wrong one. Right? Sadly, that’s a no. Those small formatting differences will throw off the entire page when printing, and you will literally have to start again from scratch. (Plus you might need to buy more paper!) Save yourself the headaches and get it right the first time! Once you’ve got your template, do a mail merge, insert the names from your spreadsheet into the template. This will integrate all attendee names into the correct format. You also avoid the risk of misspelling any names. If you’re not familiar with doing a mail merge, this YouTube tutorial will help. Don’t forget to add your company or event logo on your document! Once you’ve completed your mail merge, skim the final document to ensure everything turned out the way it was supposed to. My technique? Every few letters of the alphabet, pick a name from your spreadsheet and make sure that name is in your completed document. Now I will cross my fingers for you that the printer works and is full of ink! While it’s great to be prepped and ready as soon as possible, I recommend waiting as long as you are able to print name tags. That way, you will hopefully only have to go through the printing process once! Even when you wait as long as possible, you can still have last-minute registrants. Or, someone could ask to transfer their ticket. A manager may no longer be able to attend and ask if they can send their co-worker instead. Print the new name tag now, and slot it into its correct alphabetical place when setting up at the event venue. If you have the ability, you can print last-minute name tags on-site at your event. And (conveniently! ), printing name badges on-site happens to be the next section! Despite your best efforts, it still happens. You’ll find yourself with a guest standing in front of you...and no name badge for them. Perhaps an executive at your company told the individual, “I’ll get you registered!” and it slipped through the cracks. Or, a registered attendee could send a coworker to go in their place. In this case, it’s best not to have them walking around wearing the other person’s name! Handwritten names. This is my least favorite option. Guests don’t like walking around with a handwritten name tag when everyone else’s is printed. No one wants to feel like an afterthought! In a pinch it does work though, and it’s better than no name tag! Bring a label maker. Instead of handwriting someone’s name, a simple solution is to bring a label maker. It won’t look quite the same as everyone else’s, but it is still more professional than a scribble in pen! There are also portable little printers you can bring to your event, and print a name badge right there at the venue. Bring a portable printer. For the most professional look, you can bring a portable printer with you to the event. You may need to bring a laptop to connect to the printer. It looks nicer than a label maker, and it’s much faster typing a name on a computer instead of a label maker! Be aware that a portable paper will require specific paper. You may not be able to use the same cardstock you would in your office’s printer. Unless your name badges are stickers, you need to bring extra holders and blank inserts for any of these options. If you need to create new name tags, you can ask for a business card. I highly recommend this, especially if you have a growing line of people waiting! Pro tip: Make sure you note what the person looks like, or a specific item they’re wearing. Otherwise you will have created a new awkward situation! I learned that lesson the hard way, when I found myself walking around with three newly printed name badges to hand out. After successfully locating the first two attendees, I was wandering around looking for the third. Only to realize I could not, for the life of me, remember which “man in a dark suit” I was looking for! 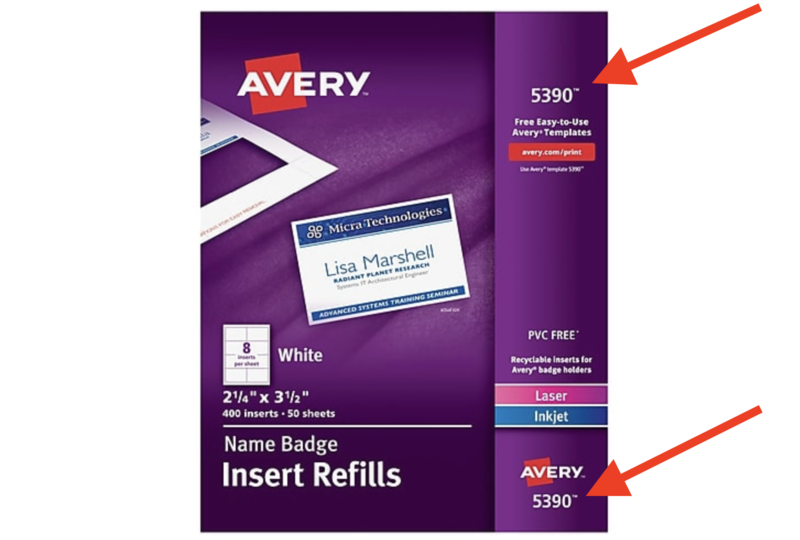 I’ve touched on the option between paper inserts versus stickers when printing name tags. If you decide to use the inserts, there are a variety of name badge holders you can choose. The types of printed name tags you I'll discuss here are sticker name tags, clip-on name badge holders, pins, magnetic name badges and lanyards. He’s got on just about every option there. Each of them, (including stickers,) have something to consider for your event guests. Stickers are more cost-effective than those requiring a plastic holder; you only need to buy the paper you print on. However, I’m not a huge fan of stickers. Half the time I don’t even know it’s happened. Then I meet someone, notice them looking confused as they try to read my name, and, oh....whoops. There it is. My name tag has, yet again, grown legs and jumped the sticky side from my shirt to my hair, hiding my name from potential new friends. Seriously, I don’t know how it happens. But the worst part is trying to get the name tag off of my hair, without pulling out my hair in the process. Oh yes, and that’s always fun to do when you’re also overcoming those networking nerves! The desire to avoid my hair being pulled out is not a deal-breaker. Stickers are easy to use, cheap, and shouldn’t damage clothes. Plus they save time, you don't have to make your assembly line as you insert the printed name tags into their holders. My only point is – it’s worth considering! Aside from stickers, this is the most common type of name tag. There is a little clip on the back for attendees to attach the name badge to their clothes. 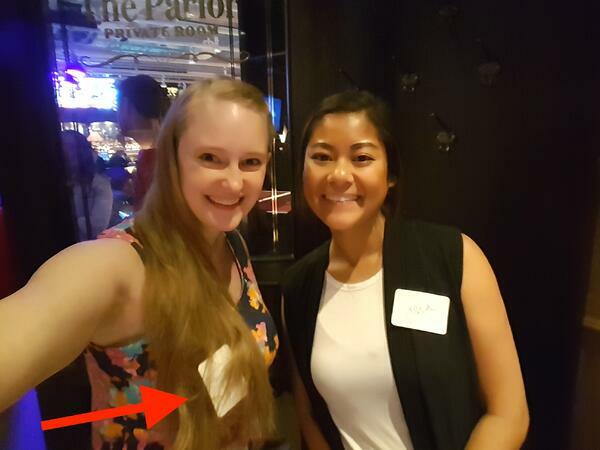 Unless you are doing the combo clip and pin, the pinned name tags make me wary; especially when it comes to corporate events. While you don’t have to worry about the lack of a shirt pocket to clip a name badge, not everyone wants to put holes in their clothes. Yes, the holes are little. But corporate attendees often make an effort to wear nice clothes, sometimes even their favorite. And those can be made of expensive materials, like silk. I’ve had a few moments of furrowed brows as I unpin my name tag, rubbing the fabric and willing the little holes to go away. Thankfully, the holes are small, and don’t usually leave a lasting hole. Pins are also easy to attach, and they’re not very expensive. In addition to avoiding the issues of stickers or damaging clothes with pins, you don’t need a pocket to clip the name badge onto. 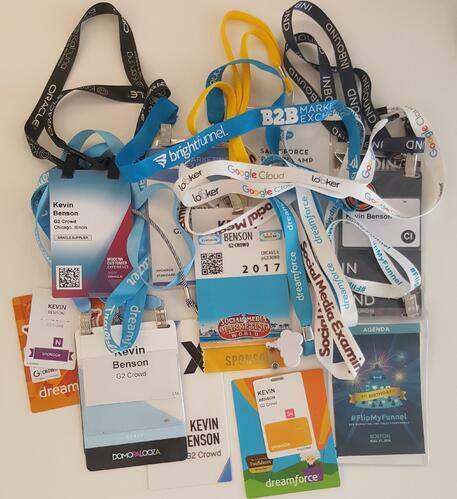 Lanyards are great because they avoid all of the above issues. The biggest drawback is cost; you have to pay for both the plastic name badge holder and the lanyard. 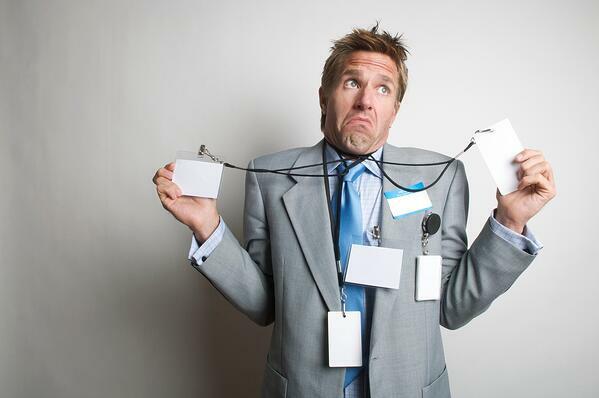 If guests don’t remember to return their name badges, the costs will continue to accumulate with your events. The name badge itself does also hang a little lower, making it harder for a sneaky peak at a new contact’s name. 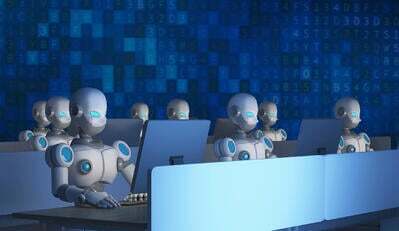 However, most people understand when a fellow attendee is looking to see their name or company. That is after all the point of networking! It’s worth noting that not every event will require you to physically print your own name badges. If you are planning a larger event, such as a conference, you might be working with an event management company, which will create them as part of its services. Alternatively, you could pay a printer to produce the name badges. This will require you to have a final guest list with more lead time than if you were printing them yourself. These name tags look great (and super professional! ), but they also come with a big price tag. A starter kit ranges from $1,100 - $2,500. You will need to continually buy ink and PVC plastic cards, which are more expensive than cardstock or stickers. Conference name tags are often used with lanyards. Some of them will come in a thin plastic holder, where attendees might place business cards behind their name badge. In this case, they usually aren’t made of a PVC material. Notice how some of them have a QR code; this will be used to scan attendees when they enter breakout sessions. Sponsors can also scan that code when attendees visit their booth. 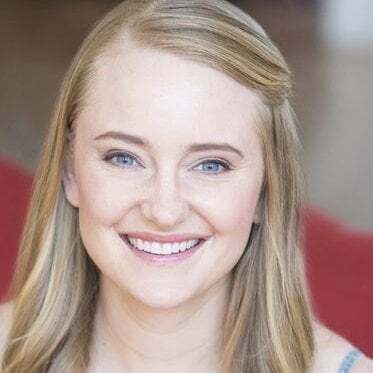 For example, if Laura visits our booth at G2 Crowd, we’ll receive her information, including name and email address, enabling us to follow up with her after the conference. Some of the lanyards display the opportunity to use your name tag as a sponsor benefit; the blue lanyard for the B2B Marketing Exchange was sponsored by Brightfunnel. While the name badge process can be a bit tedious, it is crucial to a corporate event’s success. And, once you get your process down, you’ll find this part of your event planning process getting faster and faster. Soon you’ll be a name badge pro, speeding through your printing and assembly process in no time! Whichever materials, printing and trouble-shooting process you choose, my little friend and I know you can do it! 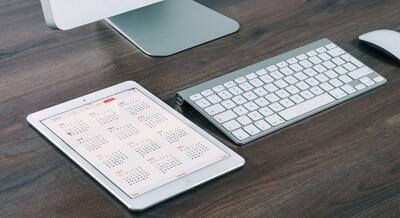 Looking for additional event marketing professional resources? Check out my guide on post-event survey questions and choosing an event venue. Then, ensure you're making as many name badges as your event venue will hold by booking a speaker your attendees will love. Search the G2 database and find your next speaker who inspires, delights, and happens to be a woman.